As I was laying in bed last night, I realized that I still have so much to do/make/photograph before I reopen my shop. It's just not going to be possible to get it all completed in 24 hours. I thought I could get it done, but I don't want to stress about it. I like to enjoy the process. So, I've decided to push back the reopening until next week. One Hundred Wishes will reopen on Friday, August 8. I promise. No more changes. No, really! I'm so glad so many of you are excited to see what I've been up to, shop-wise. Next week will be here before we know it! Thanks, as always, for your enthusiasm and support. You guys are the reason I love what I do! 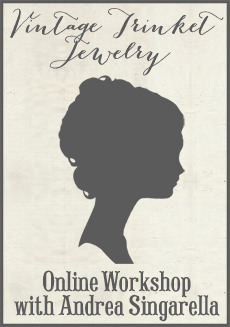 I just came upon your site as a lady that I know makes jewelry and has your glitter. I saw your web address on it and had to see what you had. I hace been reading your blog and just love your things. DO you sell all the things you ahve pictures of ??? I never saw your other site and was so excited to see it tomorrow and now see I have to wait another week. : ((. I can't wait to see what you have . I think you also sell to a shop near me that is fabulous . It is called Deal Lizzie --in Utah. Oh Andrea, the last thing we want is for you to have more stress. So glad you've decided to allow yourself more time for the shop re-do...it should be fun for you:) And I'll try to be patient as I sit on pins & needles! Really I will:) Besides, it'll be worth the wait...I'm sure whatever you have in "store"(yes, pun intended) will be grand! PLEASE DO NOT ADD MORE STRESS ON YOURSELF. I MUST ADMIT, IT WILL BE HARD TO WAIT UNTIL NEXT WEEK. BUT, IT WILL BE WORTH THE WAIT TO SEE ALL THE WONDERFUL GOODIES IN YOUR NEW SHOP. TAKE CARE!! don't ya just hate it when you get in bed and your wheels are still spinning? Sometimes the creativity hits me right in the middle of the head right at that time! Good idea to move it back. That way you will be able to enjoy it~ I saw your ad in Somerset Life, loved it! I can't wait to see the new site, I will have to peak when I am on vacay. I am supposed to get some snippets of my new site before I leave. We are going for a funky vintage look, should be interesting!! I'm sure it's worth waiting for Andrea. Looking forward to next week and just in time for my birthday on the 9th. And, a girl needs to treat herself on her birthday, right? Oh I just can't wait! I know everything is going to amazingly beautiful as always and of course...soooo worth the wait. Enjoy the process. Happy Day! I can't wait to see the new look~I bet it will be so pretty~ And I do need some glitter! Take your time my dear....we are a patient bunch :) Something to look forward to!!!Yippee! Happy Anniversary, Andrea! I am glad and lucky to call you a friend. My wish for you is continued success, inspiration, and creative fulfillment with One Hundred Wishes! reopens..and your blog is delightful! !